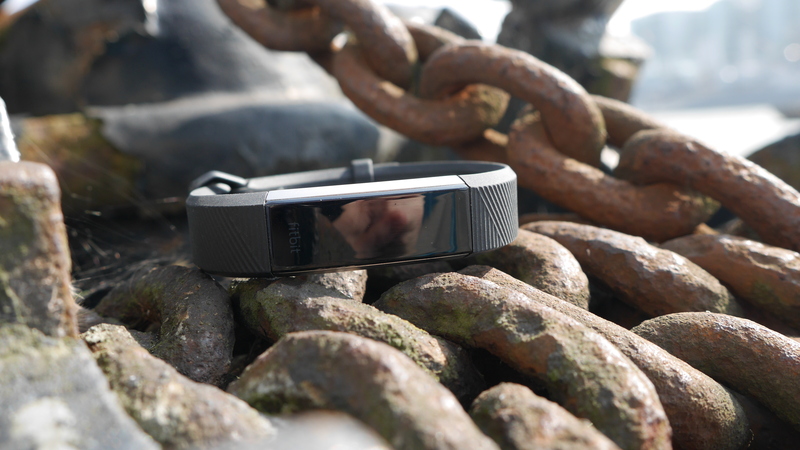 Activity trackers are everywhere. Whether you run 10K every weekend or do little more than plod to the bus stop in the mornings, many of us have some form of sensor strapped to our wrist or shoved in our phones, tracking our every movement. When those movements are in the form of steps rather than cycles or lunges, Fitbit is king. The brand's device range is sprawling including the smartwatch inspired Fitbit Ionic and Fitbit Blaze, along with the general-purpose Fitbit Charge 3 all the way through to the most affordable in the range, the Fitbit Flex 2. Between those last two products sits the Fitbit Alta and the Alta HR. As its name suggests, the Alta HR has thrown an integrated heart rate scanner into the mix without bigging up the device’s bulk. This takes its skills beyond the basics and from fitness tracking into the realms of more in-depth fitness monitoring and improving. It’s an addition that boosts the device’s abilities, but one that comes at a cost. Despite its simplistic look and modest array of sensors, the Fitbit Alta HR isn’t the most affordable of devices. Available at launch for $149.95 (£129.99, AU$249.95) we've now seen the price drop as low as $140 (£120, AU$230) from some retailers but it hasn't budged much more. It may sink a little lower during sales periods, but it's a relatively expensive fitness tracker considering what this can do. Okay it's not exactly Apple Watch 4 levels of wallet abuse, but for what’s still essentially a glorified pedometer, it’s a sizeable chunk of change. If you can live without the HR skills, you can pick up another device with the same level of activity tracking for much less, such as the Fitbit Alta for $130 / £100 / AU$149.95 or other alternatives like the Garmin Vivofit 4 cost around $79.99 / £69.99 / AU$159. The extra expense of the Alta HR might deter many, but before you dismiss it based on price alone, we’ve been living with the Fitbit Alta HR to find out if its actually good value for the extra coin. 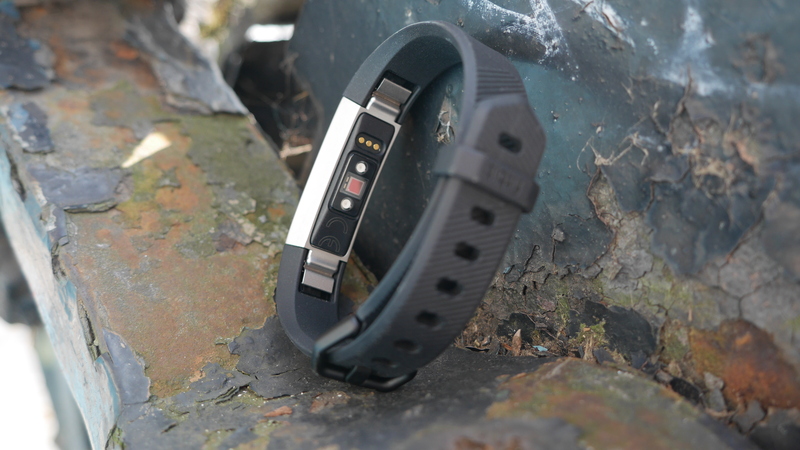 When it comes to looks, the Fitbit Alta HR is classic fitness tracker. A small stainless steel sensor pod strapped to your wrist with a robust and sweat-resistant rubber strap. It’s not exactly thinking outside the box, but when the box can look this good, who cares. At just 15mm thick, it’s large enough to host an easily readable display while lining up 25% slimmer than its big brother, the Charge 2. That’s key. 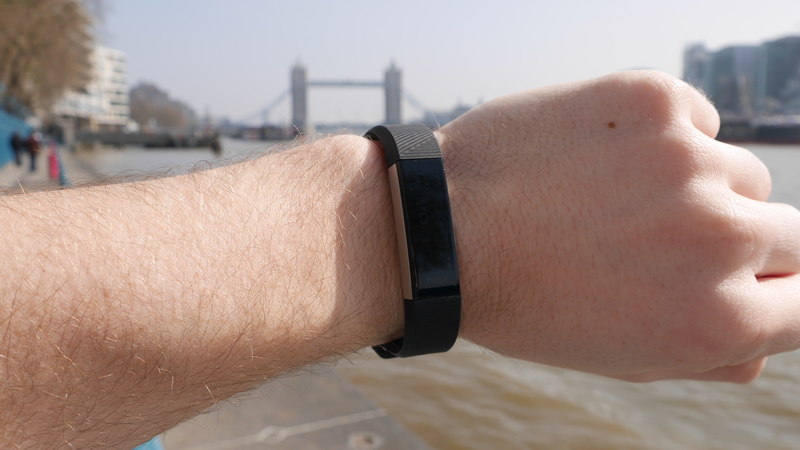 Although this looks like a fitness tracker, it’s not grabbing people’s attentions like many rubbery wearables do. It’s a sleek, stylish design that shows the world you’re keeping fit without making everyone worry you’re going to bore them with your latest training tips, or encourage them to eat nothing but kale and quinoa. As well as being easy on the eye, the Alta HR is comfortable too. The device’s barely-there body is light and gently curved to the arc of your wrist, securely locking in with a plastic buckle that ensures the Alta HR never feels at risk of jogging loose whether walking in the woods or doing sprint sessions. Its slim form factor and lack of physical buttons give it a clean, almost jewelry-inspired finish, with the option of a silver, black or gold metal body further refining the look. The inbuilt display is basic, but pleasingly so, offering up all the required information without bombarding you with unnecessary figures and battery-sapping showy graphics. It’s not faultless though. Take it out on a sunny day and visibility quickly becomes an issue - this isn’t the brightest panel and it can quickly get overshadowed by sunlight, making it almost impossible to read without first shielding it. This is a pretty serious problem, and one that’s bound to annoy those who live in places that are more consistently sunny. Finishing the look, the Alta HR comes in a variety of color schemes, with the different body options able to be paired with a variety of straps direct from the box. These range from understated black to more vibrant coral and fuchsia hues. You’re not stuck with your day one color choice either. Decide that your playing it safe black band is a bit boring, fine. It can be quickly unhooked and replaced with one of Fitbit’s many more colorful and stylish options. These aren’t just limited to rubber either, there are leather straps, fabric ones and even cool metal watches that the Alta HR’s pod can be clipped into. 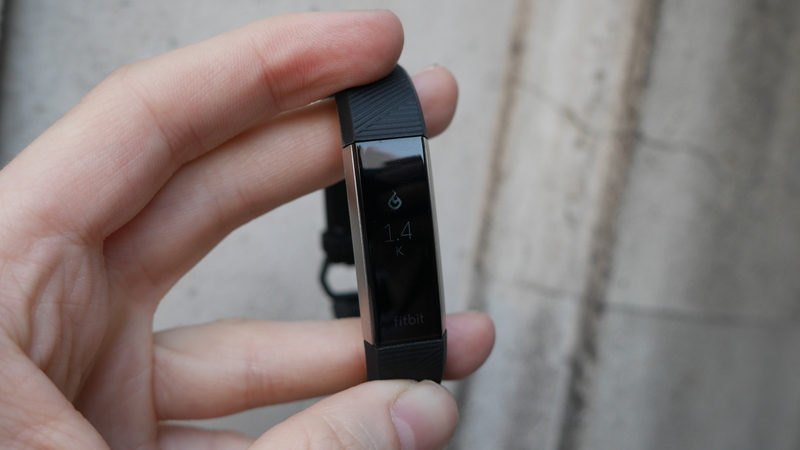 As with Fitbit’s other activity trackers, you’ve got two strap sizes to choose from, small or large. We’d recommend trying Fitbit’s printed sizing chart before splashing the cash because the large strap is pretty massive and many will be able to get away with the small strap. 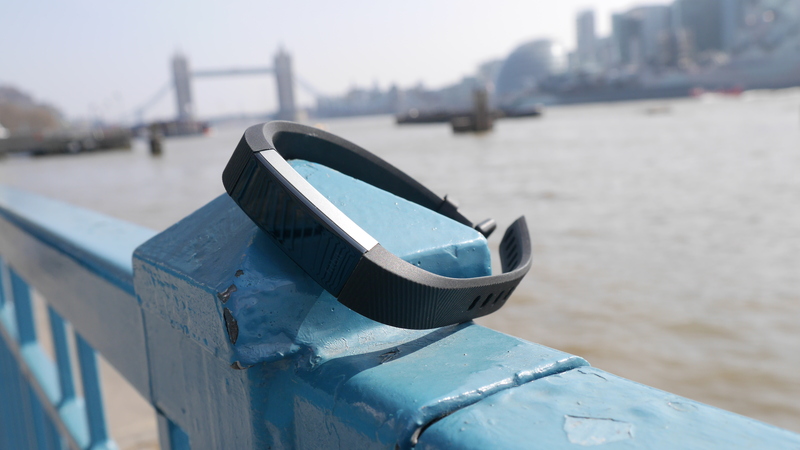 Traditional in looks, the Fitbit Alta HR is as you’d expect when it comes to fitness tracking too. The wearable’s inbuilt sensor pack is bang on, accurately recording each and every footfall without getting too confused by wild gesticulation or shuffling along with your hands in your pockets. Its heart rate sensor is its main draw, however. Fortunately, this is also pleasingly on-point. We found it to be a solid inclusion, accurately relaying our BPM whether lounging on the sofa or putting in a shift on the treadmill. Having the heart rate monitor is about a lot more than giving you an extra number to look at during your weekend runs though. The Alta’s optical sensor works in the background to keep tabs on your resting and active rates throughout the day, both good metrics for general fitness progress and overall health. This is then graphed out within the accompanying app, showing how your fitness levels are improving over time. Although the Alta’s added HR makes it potentially step on the toes of the Fitbit Charge 2, it's still missing many of its big brother’s fitness-friendly features. This list of omissions includes dedicated workout modes, VO2 Max tracking, guided breathing and Connected GPS abilities. 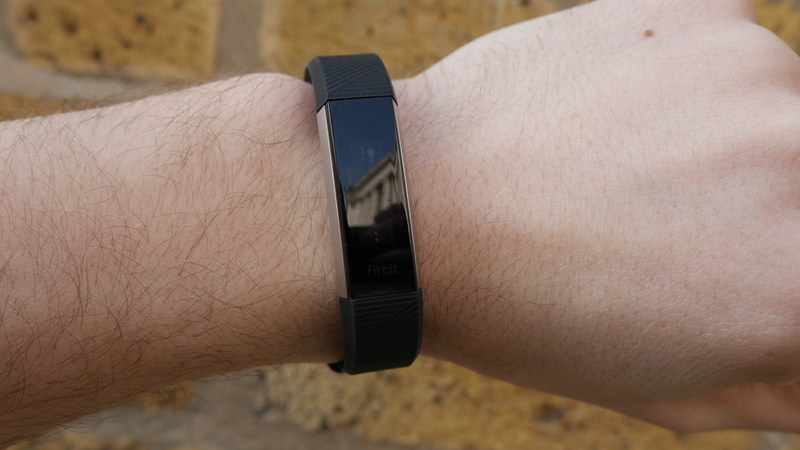 Fitbit has found a workaround for one of these though, the missing dedicated workout modes. With no way of telling the device when you’re going for a run like you would on the Apple Watch Series 3 it’s down to the Alta HR to pick up on things. Fortunately, the device does a great job of this. Activity is automatically detected and logged accordingly. We found that occasionally our sessions were miscategorized, but, for the most part runs were tracked as runs, a Metafit class as an ‘Aerobic Workout’ session and a game of football as ‘Sports’. Sadly, not all of the Fitbit’s features work so seamlessly. The lift-to-wake feature, which should cause the screen to display the time whenever you raise your wrist to your eyeline, is a little temperamental. You’ll regularly find yourself repeatedly flicking your wrist up, trying to get the right level of pop to bring it to life. Things aren't much better when you get hands-on either. Although lacking a touch sensitive panel, the Fitbit Alta HR lets you use your finger to move through the multiple menus. Instead of swiping, you’ve got to tap it, with the short, sharp movement transformed by the inbuilt sensors into a control mechanism. You’ll need to give it a couple of taps to bring it to life, with each additional nudge cycling you through one of the device’s menu options. Or at least that’s the theory. The trouble is, this isn't as responsive as it should be. You’ve regularly got to give the wearable multiple nudges to get it to respond and move to the right display option - the customary steps count is joined by total distance covered, real-time heart rate, calorie burn and time active. The screen’s good for more than relaying your live step count though. While this is a device that’s definitely more fitness tracker than smartwatch, it’s not completely devoid of smart skills. Synced with your phone - it plays nice with iOS, Android and Windows Phone - you can get call alerts, message notifications and calendar reminders pinged directly to your wrist. Messages aren’t the easiest to read, scrolling along vertically, but it’s a welcome addition and one that, combined with the device’s vibration alerts, comes in handy. As well as keeping tabs on all your movements, the Fitbit Alta HR also does a great job of monitoring you when you stop. As well as mapping out your resting heart rate throughout the day, its sleep tracking skills are pleasingly on point too. There are no misreads and mess ups, no adding a 30-minute sleep session whenever you take the device off to jump in the shower. Instead you get accurate and detailed tracking that shows your night’s journey through periods of restless and deep sleep. 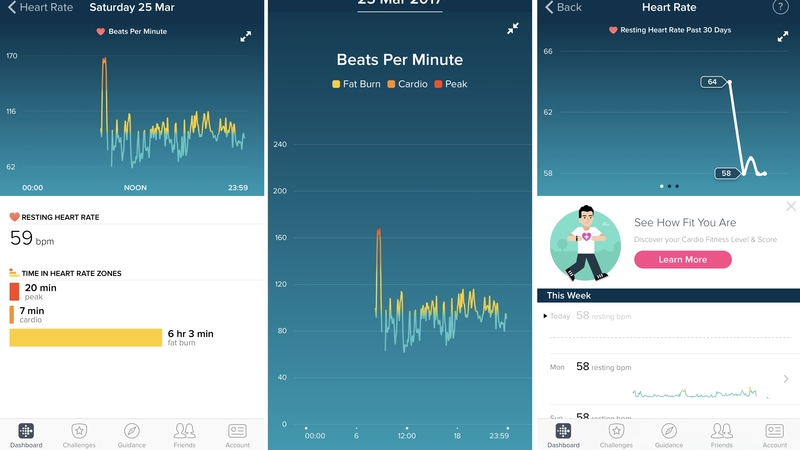 All this data is now being more accurately tracked too, with Fitbit’s Sleep Stages feature combining accelerometer with heart rate data to more accurately monitor your sleep quality. Being able to track more metrics than some of its rival is all well and good, but it’s what you can do with all that information that really matters. Fortunately, the accompanying Fitbit app is tried, tested and, for the most part, a joy to use. Like the Alta HR itself, it’s not overly flash or unnecessarily over the top. Instead, its simple elegance and accessible layout are what make it such a winning option. Mapping out all of your data in accessible charts, it breaks down your daily activity by whatever standard you want, be it steps, distance, calorie burn, or time active. Each metric can be addressed broadly or as a deep dive, with intimate detail available ranging from the number of calories burned during that 5K run to the steps taken on your walk home from the train. Heart rate too is crucial here, with the ability to see not just how your heart rate reacted to exercise, but the heart rate zone you were working in over that time period. This gives a better indicator of the effort you’re giving and, along with your daily resting heart rate map, helps detail your improving fitness levels. Building on the core data, there are plenty of guiding pointers and encouraging words to get you pushing to that next personal best. Badges and Challenges act as a great incentive, as does being able to set up competitive exercise groups with friends. These aren’t limited to the smartphone-hosted app either, but pushed forward through the device itself. Giving you encouragement to get and stay active, there’s a fine line between motivation and enthusiasm-destroying nagging, and unlike some of the competition - we’re looking at the Samsung Gear Fit 2 here - the Alta HR perfectly traverses this tightrope. Sit still too long and you’ll be encouraged to move. There’s a pre-set target of 250 steps per hour and if you’ve been lounging too long you'll get a nudge to get up and get moving. These vibration-based alerts are joined by a broad selection of at times funny words of encouragement. It’s a nice touch that stops repetition creeping in and will help you keep those fitness goals going longer. If you really want to make the most of the Fitbit Alta's heart rate skills and get into some more serious training, there's good news here too. At the end of 2017, Fitbit launched Fitbit Coach. A paid app, that you can access from the main Fitbit app, it adds some impressive coaching skills to the Fitbit network with 100s of video workout drills. There's a catch, while there are some free workout sessions in the app, the majority are locked away behind a paid premium paywall. Access to the premium app will still set you back £5.99 per month for £29.99 ($39.99, about AU$50) for the year, though there are some free workout sessions in the app too. These are frustratingly hard to find in the Coach app. That said, this is cheaper than a gym membership and great for equipment-free home workouts. 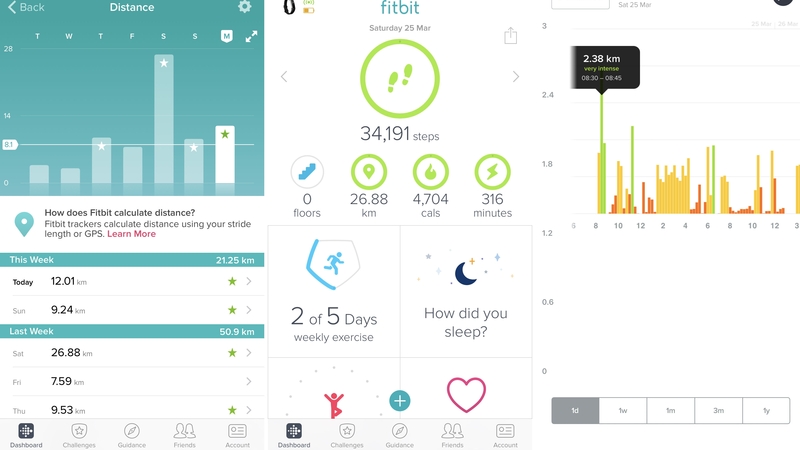 You'll also need to download a second Fitbit app which will frustrate some people, though this is the same approach that Nike and the UnderArmour fitness app network takes, where there are distinct apps for different needs. There's not getting away from the fact it's a little annoying to flick back and forth between apps though. That gripe aside, Fitbit Coach is a serious training partner, recommending personalised video workouts based on your Fitbit activity and making it simple to follow loads of different exercises, not unlike we've seen done with Moov Now. There's run and walk coaching too and you can choose your preferred trainer and Fitbit Radio is there to provide musical motivation. 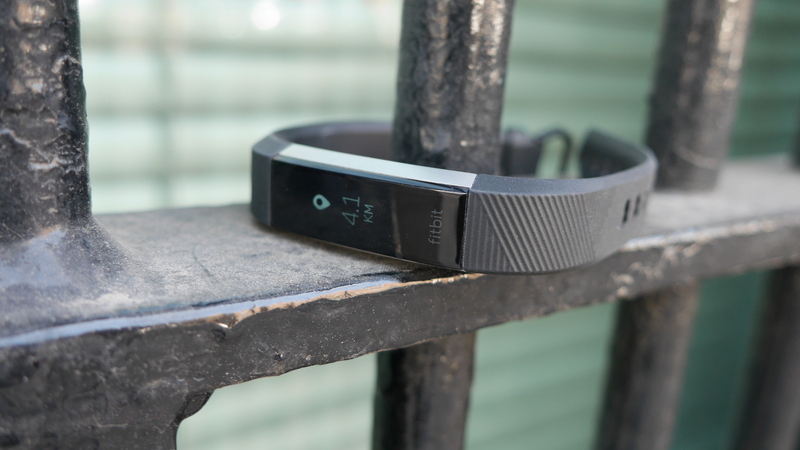 We salute Fitbit for getting serious and pushing beyond those how-far-can-you-walk limits. Given its size, the Alta HR’s battery life is decent. No, it’s not going to last a month between trips to the mains like you’d ideally want, but we managed just short of a week before getting nervous about our dwindling power supply and making an emergency trip to the mains. This is about what we’d expect from such a device, although it does mark an improvement on the standard Fitbit Alta’s five day staying power. When you do have to power up, you’ll have to fish out yet another proprietary charger, with this one clipping around the device. What’s more annoying than this slightly fiddly cradle design, however, is how short the power cable is. Unless you have an especially low side table or an extension lead, you’ll be charging the Alta HR on the floor. Why does this matter? Well, it creates an out of sight, out of mind situation, making it easy to forget about when heading out after an evening connected to the mains. 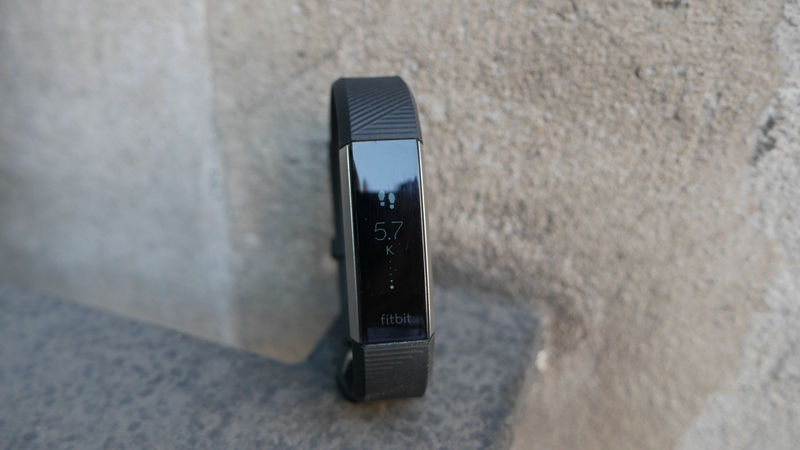 The Fitbit Alta HR is a brilliantly well-rounded entry-level fitness tracker that, thanks to its new heart rate tracking abilities, offers something more than many of its rivals. It’s a no faff, no fanfare device and one that’s a simple, elegant solution to track all your footfalls and exercise sessions. It’s a tracker that brings peace of mind knowing you can trust everything that’s relayed to your phone and, despite not doing anything unique or special, stands out for its consistency and accuracy. It’s a refinement of a now familiar process, is easier on the eye than most and offers a more robust app platform than much of the competition. It’s not without fault though. Its display really struggles in bright sunlight, and this is a serious mark against a device that’s effortlessly accomplished in most other areas. The Fitbit Alta HR is the fitness tracker for the everyman/woman. It’s a device that will encourage you to get moving, and take you from general activity to a bit of light sport without ever feeling like you’re wanting for features. Its heart rate scanner is a great way to keep a more accurate track of your improving fitness levels and calorie burn if that’s what you're after, while the accompanying app does a great job of making your data accessible and understandable. It’s a device for those of you looking to develop and maintain a basic level of fitness rather than strive towards a new half marathon personal best, and those who fear the added complexity of the Fitbit Charge 2. If you’re after a general-purpose activity tracker, you can do a whole lot worse than the Fitbit Alta HR. 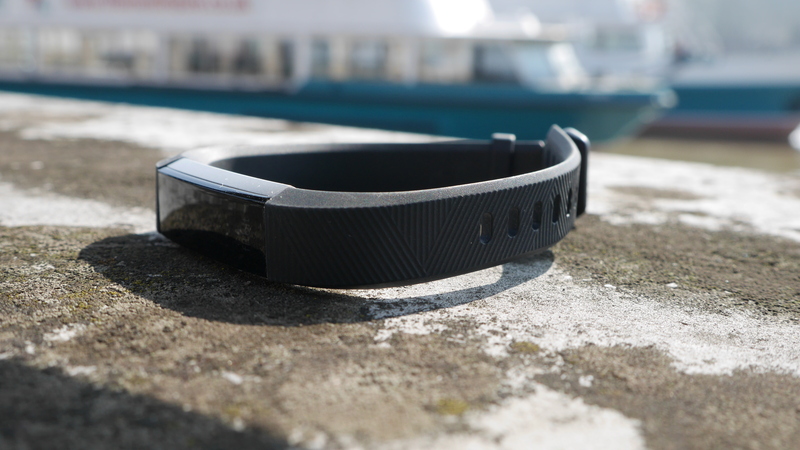 Its increased feature list and higher price tag edges it perilously close to the Fitbit Charge 2, muddying the waters of choice, but it still succeeds as a solid fitness tracker in its own right. Not only is it accurate and easy to use, but it looks great too. Its battery life is solid and its customization options impressive. Just be wary about taking it out in the sun too often, you might strain your eyes with all that screen-struggling squinting.